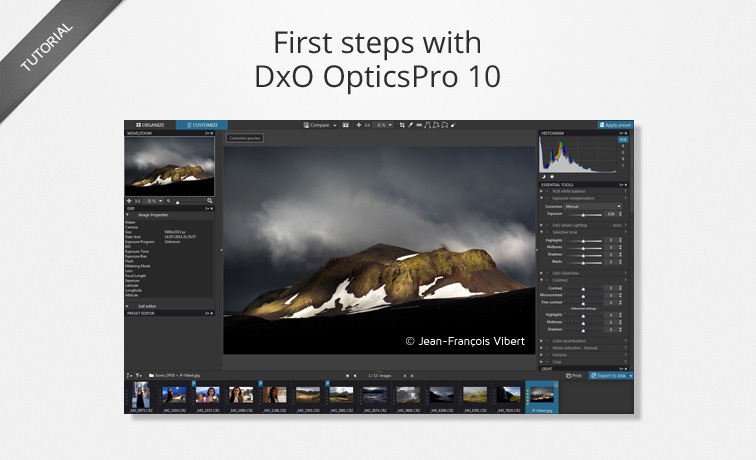 DxO OpticsPro 10 is an application that processes JPEG and RAW files from your camera so as to ensure the best possible image quality. One of the fundamental advantages of DxO OpticsPro is that it can provide an entirely automatic workflow based on a default preset and on Optics Modules. The default preset automatically applies a set of corrections as soon as you open an image in the application. To these corrections are added those provided by a DxO Optics Module that is specific to the camera/lens combination used to take the shot. All you need to do afterwards is export your images to your hard drive. The DxO OpticsPro 10 interface (Customize tab). 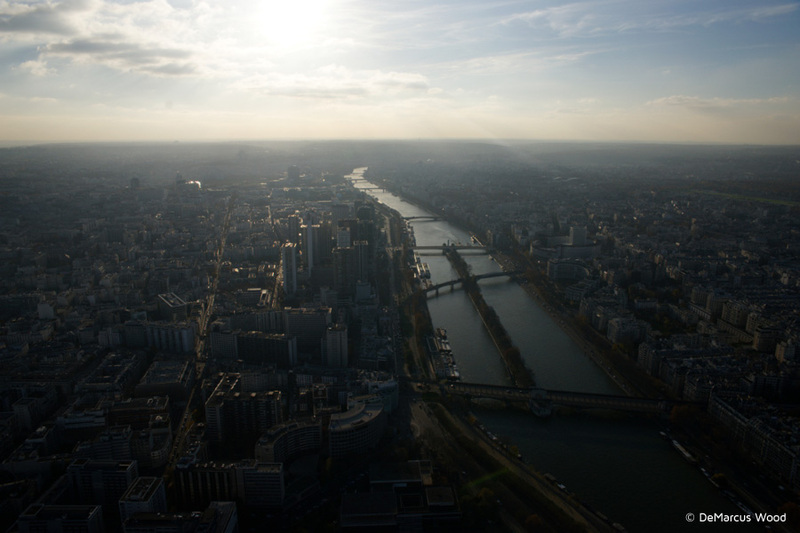 Preface: Which format should you choose — JPEG or RAW? To get the best quality from your images when using DxO OpticsPro, we recommend that you use RAW format when shooting. For one thing, doing so will give you much greater latitude when correcting your photos, particularly with respect to hue brightness and contrast. For another, DxO OpticsPro does not modify the RAW file itself, which means that you can always undo the corrections as well as protect the original file. As for JPEG files from your camera, you need to consider them as finalized images, since they’ve already been corrected and processed by your camera. Any possible post-processing corrections will be much more limited. In this tutorial, we will therefore work on a RAW images in order to show you more of what DxO OpticsPro can offer. JPEG image processing is still possible, of course. The Customize tab, which contains all the image correction tools, which are described in more detail in our tutorial for more advanced users of DxO OpticsPro. The DxO OpticsPro 10 interface is customizable. You can create your own workspaces (in either edition) as well as create your own tool palettes (Elite edition only). Go to the Organize tab to browse through the contents of your hard drive. The tab fields consist of a Source Browser to the left, a large Viewer pane for displaying an image, and on the bottom, an Image Browser which displays thumbnails of the content of the selected folder. Located on the left of the Viewer pane, the Source Browser displays the hierarchical list of folders in your computer’s disk drive. It functions in the same way as the file browser for your PC or as the finder for your Mac. Find the folder with the images that you want to correct in DxO OpticsPro, then click on it to select it. The very moment you select a folder of images and then open it in the Image Browser is when DxO OpticsPro automatically corrects the images using the default preset and the Optics Module(s) appropriate for your equipment. Located underneath the Source Browser and the Viewer, the Image Browser displays thumbnails of the content of the folder that you selected in the Source Browser. To display an image in the Viewer, simply select its vignette. You can change from one image to another by clicking on the corresponding vignette, or by using your keyboard arrow keys. By default, the thumbnails display only the name and the star rating (if used). However, they can also contain a certain number of indicators tied to the status of a particular image and its corrections (e.g., availability of a DxO Optics Module, processing status, processing authorization, etc.). One of the two pillars of image correction in DxO OpticsPro are its DxO Optics Modules. DxO Labs analyzes camera/lens combinations in its laboratories in order to provide automatic and high-quality corrections for optical defects. The DxO Optics Modules library contains thousands of camera/lens combinations to which more are added on a regular basis. You don’t have to do anything to install and use DxO Optics Modules. 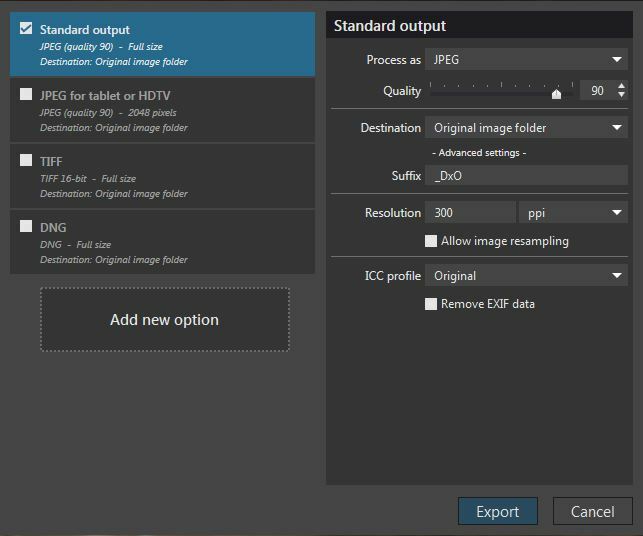 As soon as you open an image in the Image Browser, DxO OpticsPro uses the information saved in the image EXIF data about the equipment you used to shoot the photo to automatically display a window with the corresponding available DxO Optics Module(s) to download. The automatic installation does not require you to reboot your computer nor to relaunch the application. 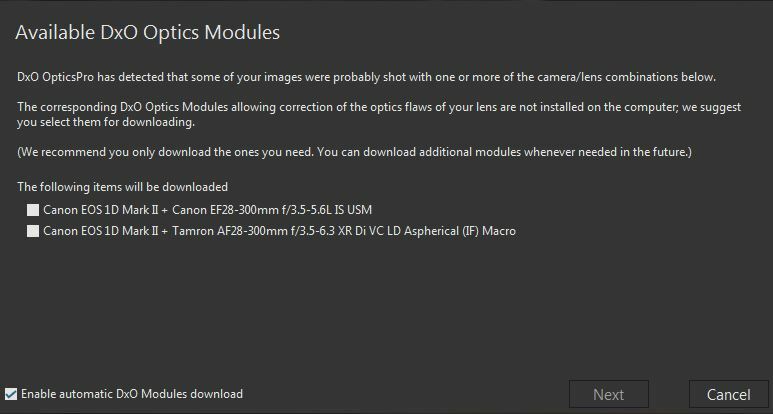 The DxO Optics Modules download/installation window. Downloading and installing DxO Optics Modules requires an active internet connection. Lens softness: Optimization and homogenization of the sharpness from the center of the image out to the edges (lens sharpness being generally more powerful in the center of the image). Image after correction. 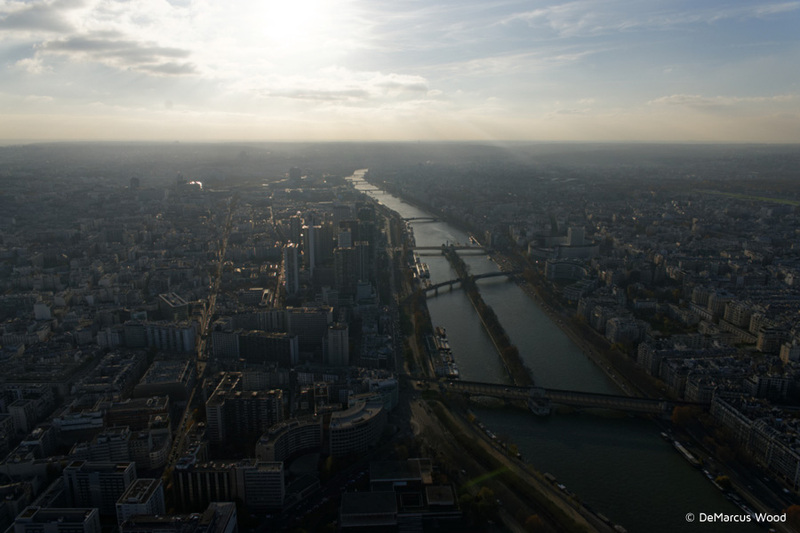 Among other problems, the DxO Optics Module automatically corrected the vignetting (the darkened edges) and the distortion (previously visible as a curved horizon line). The other pillar of automatic image correction in DxO OpticsPro is its DxO Standard default preset. DxO OpticsPro offers you a choice of creative presets that you can select by clicking on the Presets button in the upper right corner of the application. You can also create your own presets from your current settings. As soon as you select a folder containing new images, they will be displayed in the Image Browser with the corrections of the DxO Standard preset automatically associated with the photos. Noise reduction mitigates and optimizes luminance noise (graininess) and chrominance noise (colored pixels) based on your camera and on the ISO setting (set to “Auto” in High Quality mode). 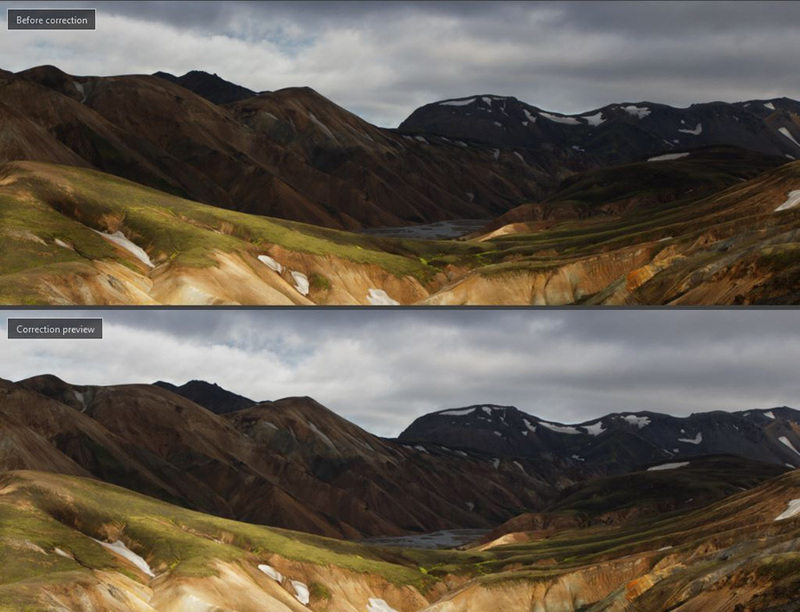 Clicking on the Compare button in the upper toolbar lets you compare before- and after-correction images side-by-side. Generally speaking, you shoot photos with the intention of displaying, publishing, and/or printing them, and so DxO OpticsPro provides you with the necessary tools for exporting your images to your hard drive (see below), to another image-processing application, to a Flickr gallery, to a Facebook page and, of course, to a printer. 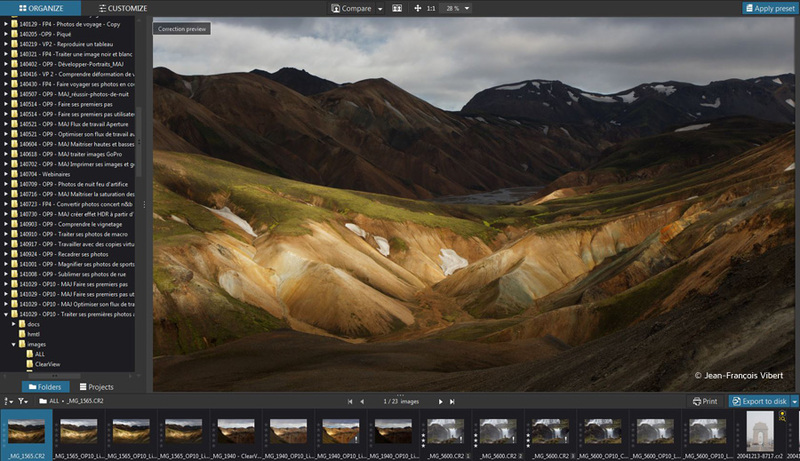 Select one or more images to export in the Image Browser. In the lower right corner of the application window, click on the blue Exporter to disk button. In the floating window that displays, you will see that the Standard Output option is activated with its default settings (JPEG format, quality 90, folder of origin as destination folder, etc.). The export progress is indicated by a pictogram that displays to the left of the blue button in the upper bar of the Image Browser. As soon as the export is finished, the JPEG file will appear in the Image Browser, ready to be published in your Web gallery, sent by email, or printed. All of DxO OpticsPro’s automatic corrections — those performed by the default preset and those performed by DxO Optics Modules — can be adjusted by using the many tools found in the Customize tab. To learn how to effectively make custom adjustments to these automatic corrections, we invite you to follow the next tutorial, “First steps with DxO OpticsPro (advanced user)” as well and to consult the other tutorials available on the DxO Academy’s dedicated DxO OpticsPro page, as well as the user guide.